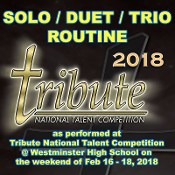 Order this product to receive both video and photos of your SOLO / DUET / TRIO routine performed at Tribute National Talent Competition on the weeknd of Feb 16, 2018 at Westminster High School. Please indicate which dance routines you would like and your dancer's name. Change quantity for number of dances you are ordering. NOTE: Both video and photos will be delivered online.